Setting off from Wollongong New South Wales (NSW), we traveled through the central southern region, setting up camp for our first night on the banks of the Murrumbidgee River. Recent rains through the region were visible in the greenness of the country we traveled through and the volume of water in the river. Being May, the weather was cold (1 °C overnight), which made for a restless sleep, but spectacular scenery at dawn. Setting of relatively early, after searching for wildlife around the camping area (a few flocks of Crimson Rosellas feeding on the grass, large numbers of Little Corellas in the trees along the river and a few other local species), we headed for the Murray River, which marks the border between NSW and Victoria. 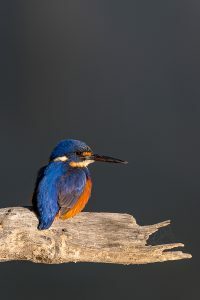 Although we arrived with time to just setup camp and cook the evening meal, a walk through the woodland the following morning yielded some nice views of a cold Azure Kingfisher warming itself in the morning sun. White-throated Treecreeper, white-browed Scrubwren and Superb Fairy-wren were also common around the campsite. The following day required us to head briefly into Adelaide, South Australia, to do a little bit of work for a client and stock up on fuel and a few other provisions in readiness for our 5 days away on the Strzelecki Track. Excitement levels were starting to rise! 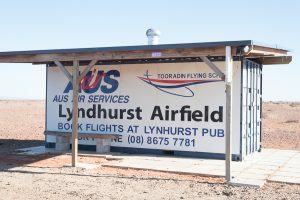 A full day of driving and we arrived at Lyndhurst, a small town at the junction of the Outback Way, which leads to the Birdsville Track, the arguably more iconic outback route, and the Strzelecki Track. We arrived at Lyndhurst just after dark and headed straight to the pub to pay for a campsite and to have a meal. The pub was crowded with cyclists who had just ridden along the Strzelecki Track from the north; either the road was in better condition than we expected or these guys are crazy – time will clarify which! Up very early the next morning, with eager anticipation of what lay ahead, but no way we could proceed until the day was light and we had a full tank of fuel. 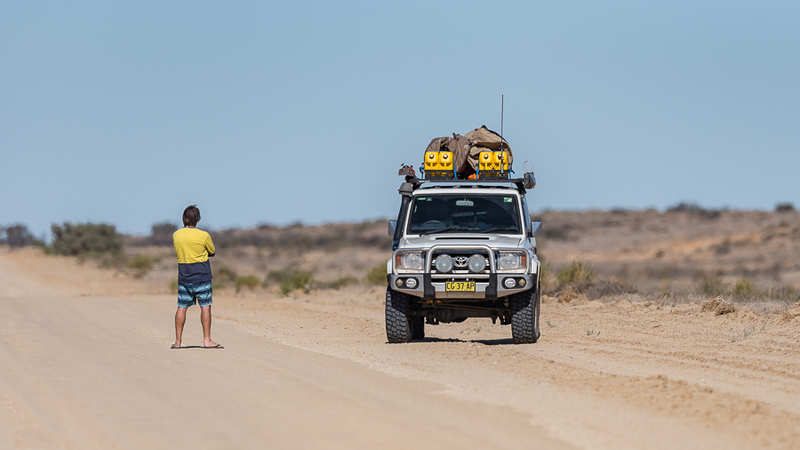 We had an extra 80 litres of fuel on the roof racks in case of emergency, but when full the tanks of the car hold over 100 litres, which should be ample for the 475km drive to Innamincka at the northern end of the Strzelecki Track. The Lyndhurst Hotel is the only place in town for a decent meal and a beer. It also sells fuel and has some great pictures and stories on the wall. If you ask the publican what the letters mean on the sign above the bar, he’ll willingly tell you! After a quick breakfast and a walk around town, we drove up to the airfield to look for Banded Lapwing, Chestnut-breasted Whiteface, Inland Dotterel, Orange Chat and Thick-billed Grasswren. Our chances seemed slim after talking to the locals, none of whom had seen them in recent months, and sadly they were right! After a fruitless search around town and the airfield we were on our way and the answer to the earlier question regarding the cyclists was answered, they were obviously mad! The track was severely corrugated and the 4WD we were in rattled and shook like mad as we drove at between 60 and 80 km/h along some the roughest road we had been on in many years, and 470km more of it lay ahead. We met several large trucks and a few other cars, some towing caravans, heading along the way, all of which were heading south, and the windows needed to be wound up each time to keep whatever dust out of the car we could. A few sections of the road had already been sealed and, although we were not expecting them, the respite from the corrugations was very welcome indeed. We stopped a number of times along the way, but were keen to get to Montecollina Bore, one of the very few established camping areas along the Strzelecki Track. Arriving at Montecollina Bore later in the afternoon, we were very pleasantly surprised indeed. The area had a large waterhole service by a bore pipe, and the overflowing water had created a magical wetland, which was thriving with birds and mammals. 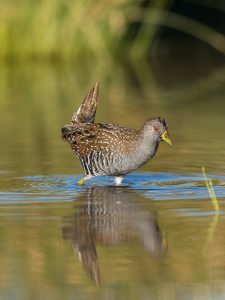 First to be seen and photographed here was a stunning Australian Spotted Crake, such a nice bird and normally shy and elusive, but this one was content to forage in the shallows next to the road while we grabbed a few nice pictures. 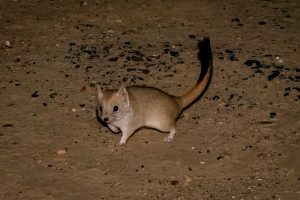 After dinner we were visited at the campsite by one of the arid country’s most enchanting marsupials, a Crest-tailed Mulgara. 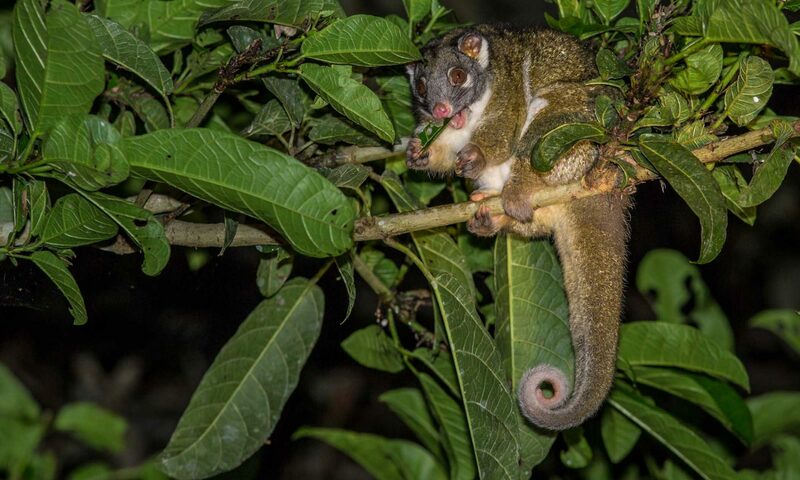 This wonderful predatory mammal features in our book, A Naturalist’s Guide to Mammals of Australia, which you can read more about on our Books page. Photographing it at night was a challenge, especially when it ran straight under the camera I was holding as I lay on the ground! 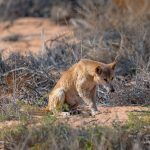 A small night-vision surveillance camera setup at the campsite captured it coming back later in the night as well, as well as a dingo – hopefully the two mammals did not meet. The next morning was spent in a small makeshift hide, taking photographs and videos of the birds that came and went at the wetlands and bore. The highlight was a small flock of Scarlet-chested Parrots (no photo opportunities), but many other birds were also seen, including Pied Stilt, Zebra Finch, Galah, Australian Shelduck, Scarlet-chested Parrot, Torresian Crow, Willie Wagtail and Emu. As we left the campsite we took the opportunity to take some drone footage of the area. This oasis in the desert looks equally stunning from the air, and its importance to local wildlife within the vast expanse of surrounding desert country was really emphasised by the the aerial footage. This will be on our Youtube channel in the coming months. 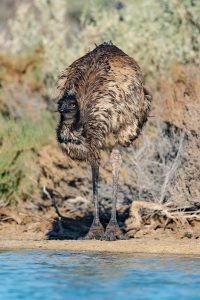 The next day was the long drive to Innamincka, the town at the northern end of the Strzelecki Track, but numerous stops were had along the way. 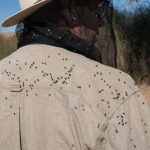 The bush flies and black flies became more and more of a pest each time we stopped, and trying to rid the car of the masses of them that tried to hitch a ride with us every time we opened the doors became increasingly tiresome. Trying to use binoculars or cameras was very frustrating, so stops were quickly dispensed with, and full steam was made to Innamincka. Upon arrival at Innamincka two items were purchased as a priority, first was a cold beer (well actually I think it was more than one) at the truly wonderful Innamincka Hotel, the other was a fly net head covering at the Innamincka Trading Post! The bush flies were a big nuisance, until the fly net was purchased! We spent the next two nights camping on the Town Common, located on the banks of the Cooper Creek, which had a surprising amount of water in it as a result of the big ‘wet’ season that had just finished in the northern parts of Australia. This was the third river/creek that we had camped next to in the past week, all of which were flowing well and all with immensely different characters. We chatted about the harshness of the land and how the arrival of water in systems such as the Cooper Creek, which is dry for most of the year, must be a spectacle to see as the first trickle makes its way down the dry creek bed. 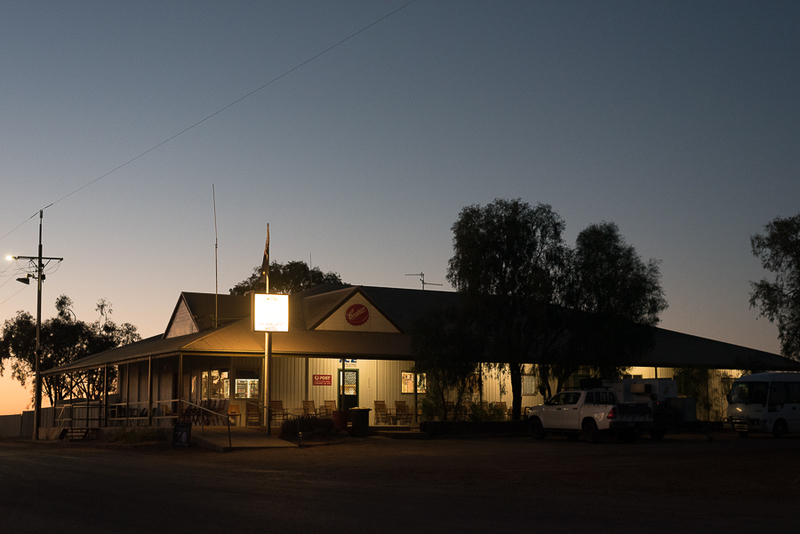 We also chuckled about how much grander the Innamincka Hotel was compared to the Lyndhurst Hotel considering that Lyndhurst has a population of 15 and Innamincka has 0. Looking back on the Strzelecki Track, as we completed the trek and contemplated our journey home through south-western Queensland and north-western NSW, we were struck by the incredible scenery of the outback desert country we had just traversed, but were also left with a sense of sadness when we thought that one day soon this iconic route might be sealed with bitumen. Considering that this was the country where the explorers Burke and Wills perished in 1861 after running out of food and water, and we had just enjoyed cold beer on tap at a grand hotel, this remote area of Australia is perhaps not as remote as we had expected. 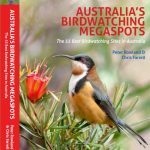 The Strzelecki Track features as one of the locations in our latest book Australia’s Birdwatching Megaspots, published by John Beaufoy Publishing and available for purchase directly from us or from leading booksellers. You can read more about this title on our books page.